It seems hard to believe, but the traditional holiday season is already more than half over. As always, there have been numerous forecasts about how retailers will fair during the holiday season. The most commonly cited estimate is put forth by the National Research Foundation, which forecast holiday sales would grow by 4.1% from 2013 to 2014. As is our custom, we generally view such projections with a grain of salt. There are two reasons for our skepticism. The first can be seen by taking a look at the following chart, which shows the relatively poor track record of such guesses. 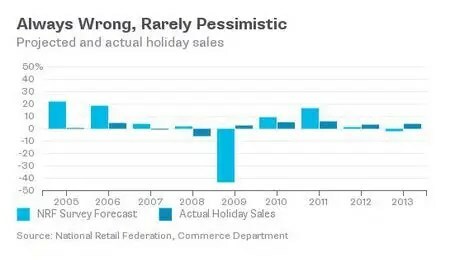 More basically, we question how holiday sales forecasts can be reliable. It seems unlikely that the majority of us can remember how much we spent purchasing holiday gifts last year. Such information is actually essential. In short, if one wants to have a chance to project how much spending changes from one year to the next, she has to know how much she spent in the prior year. Last Thursday, it was reported that November retail sales showed a 0.7% month-to-month (m/m) gain. This increase, which was the largest since March, was more than double the consensus forecast of 0.3%. The figure was even more impressive when one considers that the fall in gasoline prices resulted in a 0.8% decline in spending at gasoline stations. Gas prices continue to fall. According to AAA, they hit an average of $2.60 a gallon on Friday, the lowest since 2009. Oil prices have also continued to decline, providing further benefits for consumer pocketbooks. The sales gains were broad-based with electronics sales rising by 0.9% m/m, and clothing, department store and non-store sales all increasing by at least 1.0% m/m. The latter figure followed a 1.6% gain in October and helps support the idea that a growing share of holiday spending is taking place online. The combination of a stronger job market, low inflation and lower gasoline prices has also benefited consumer confidence. In fact, on Friday, the University of Michigan’s preliminary consumer confidence reading for December came in at 93.8, the best reading since January 2007, which was far ahead of expectations. Against this backdrop we maintain our relatively positive view about the U.S.’s economic outlook. At the same time, we note that a strong economic environment does not necessarily equate to a strong stock market. We remain loyal to our investment process and approach, which is focused on finding attractively valued companies with strong management teams that are good capital allocators. Rather than looking for firms that can benefit from near-term trends, we maintain our focus on finding companies that are well positioned for the long term.